La Cucina is Norwegian Cruise Line's Italian specialty restaurant. There are versions of La Cucina on most of the ships in the Norwegian fleet. However, on Norwegian Epic, the concept has been enhanced to become a much more substantial venue than past incarnations. To begin, the restaurant has been given a beautiful location. It is located in the front of the ship overlooking the bow. There are large picture windows both to the front and to port and starboard. 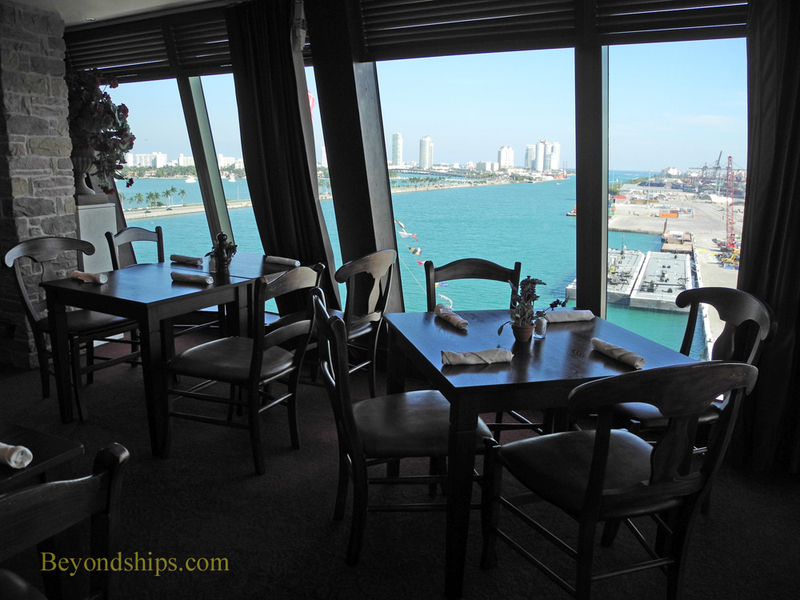 Since the restaurant is high on the ship's superstructure, the views from these windows are panoramic. The restaurant has also been given a charming décor. In previous versions, there was an attempt to make the room look like the kitchen in an Italian country house. On Epic, the restaurant has moved from the kitchen into the living rooms of the house. The furniture is still somewhat rustic but book shelves, paintings, flower vases, wood paneling and faux stone work decorate the walls. Unlike previous versions of La Cucina, this version is subtly divided into sections. Indeed, the two-deck high middle section has a live tree, which along with its sloped sections of tiled roofing, alludes to an Italian terrace. When La Cucina first began, it was envisioned that the meals would be shared by families or by large groups dining together. Accordingly, the restaurants were dominated by large tables. On Epic, the tables are smaller, most are for parties of four or parties of two. This reflects a shift towards individual servings rather than portions a group can share. The meal begins with a small loaf of bread described on the menu as “whole artisan farm bread, served with housemade infused oils.” This had all the flavor and softness of freshly baked bread. Even knowing that a fairly large meal was ahead, I felt drawn to devour it. While there has been an overall upgrade to the menu, popular favorites remain. The fried calamari was again fresh. It was lightly breaded, tender and not at all rubbery. Also on the menu is pizza. The choices include familiar pizzas such as Pizza Bolognese with Bolognese sauce, mozzarella, and Roma Tomatoes. However, another option is Pizza Peperoncino, which includes intriguing strips of spicy marinated chili beef, roasted garlic and mozzarella. La Cucina's entrees now include a rib eye steak prepared with garlic butter. This was perfectly prepared - - tender and flavorful. For dessert, I had chocolate ice cream with an espresso sauce. The ice cream provides refreshment while the espresso provides zest. In sum, I was pleased with Epic's La Cucina. The room and the menu have both moved up a notch but without becoming stuffy or confining. In addition, the execution - - the cooking and the service - - were commensurate with the venue's enhanced concept. There is a $15 cover charge for La Cucina. 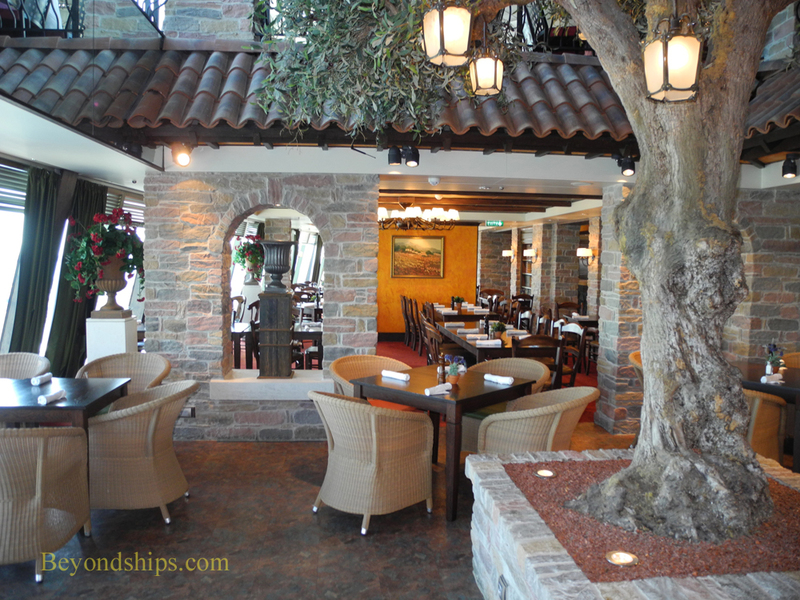 The center section of La Cucina recalls dining on the terrace of a country house (above). The restaurant offers panoramic views (below). Above: The delightful loaf of artisan bread. Below: Ribeye steak with formaggio garlic butter and polenta.